Anyone who is new to a casino, whether land-based or online, may feel a bit intimidated by all of the sights and sounds as well as the vast array of games. The following information will help new players feel more at ease in these venues, whether real or virtual. Most of the casinos in the world feature the same standard games, including poker, blackjack, baccarat, roulette, slots and video poker. Some casinos, especially the larger ones, offer these games in varying table limits and multiple types. Smaller casinos, on the other hand, generally only offer one or two variations in a moderate table limit. High rollers can always visit the VIP section of the casino for a real challenge. 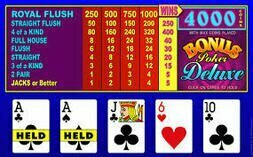 In a crowded land-based casino, players may have to wait next to slots and video poker machines or even stand around a table in order to participate. Though this may become a bit tedious, it is well worth it in the end. Keep in mind that casino dealers and croupiers have very little patience for players who do not know the game rules, so players should familiarize themselves with casino games by visiting free online game rooms beforehand. The processes for claiming winnings in land-based and online casinos differ quite a bit. In on online casino, players will visit the 'Cashier' screen and request a withdrawal through any number of means. In a land-based casino, however, players will print out a ticket from machines or physically carry their chips to the cashier window for counting and cashing in. Always count these chips and tickets twice before turning them so that discrepancies can be noted and addressed. Visiting a casino should be a fun and exciting experience, not one that is fraught with stress and nervousness. This information is designed to prepare casino-goers for their first experiences and help them to relax, have fun and win big!